In the previous research-related post, I’ve introduced the idea that natural language determiners (these little words or phrases that you can put in front of a noun, like a, the, every, three, most, all but one, several, infinitely many…) can be analysed as relations between sets. The reason that I love this intuitively simple idea so much is that it basically turns meaning into a kind of puzzle that doesn’t require a lot of background knowledge – just some basic math skills. So, as a kind of intermezzo, let’s look at the interesting case of every and only, whose meanings don’t seem obviously related in actual language, but turn out to be each other’s exact mirror images when you look at the math behind them. Then, next time you’re at a party and the topic of formal semantics comes up (as it is wont to do) you will be able to dazzle everyone with this super-interesting case study in applied set theory! The rectangle represents the universe (the set of all existing entities), the circles represent various sets of such entities. 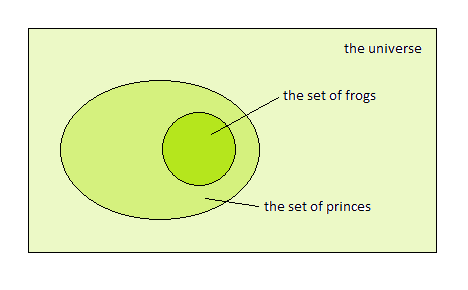 As you can see, in this particular universe, the frogs are a subset of the princes (every entity that’s a member of the set of frogs is also a member of the set of princes), so the sentence Every frog is a prince is true. Let’s summarise all this. Departing from the idea that the meaning of a determiner can be described as a relation between sets, we looked at the meanings of every and only and discovered that they represent the same relation between sets, only mirrored. And this fun little case study is a real-life example of the way formal semanticists look at language – I could do this stuff all day! Still hadn’t enough? Read more about the linguistic and set-theoretic properties of only below the cut. It isn’t hard to see that the equivalence holds in both cases – in fact it seems rather trivial. (So trivial, in fact, that it took me a while before I understood why people even bothered talking about it.) So let’s try a slightly different way to put it into words. The main thing that the property of conservativity tells us is that in order to determine whether a relation D holds between two sets A and B, we only have to look at the elements that are in A – the non-A’s are irrelevant. So in order to determine whether Every frog is a prince is true, we don’t have to consider anything that isn’t a frog. 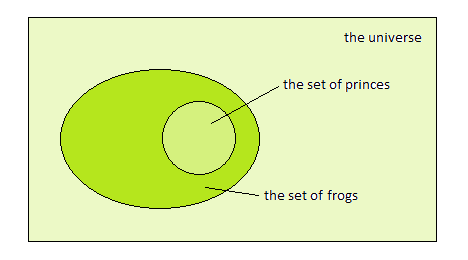 The statement on the right follows from the one on the left, but not vice versa: only frogs are both frogs and princes does not preclude the existence of non-frog princes. To sum up this part: only isn’t conservative, but it also isn’t a real determiner. This allows us to maintain the generalisation that all determiners in natural language have the property of conservativity. Why is this the case? That’s one of the remaining mysteries of natural language semantics – if you have a suggestion, let me know. This entry was posted in Language & linguistics and tagged semantics. Bookmark the permalink. Now I’m wondering whether “theoretician” is even a word.